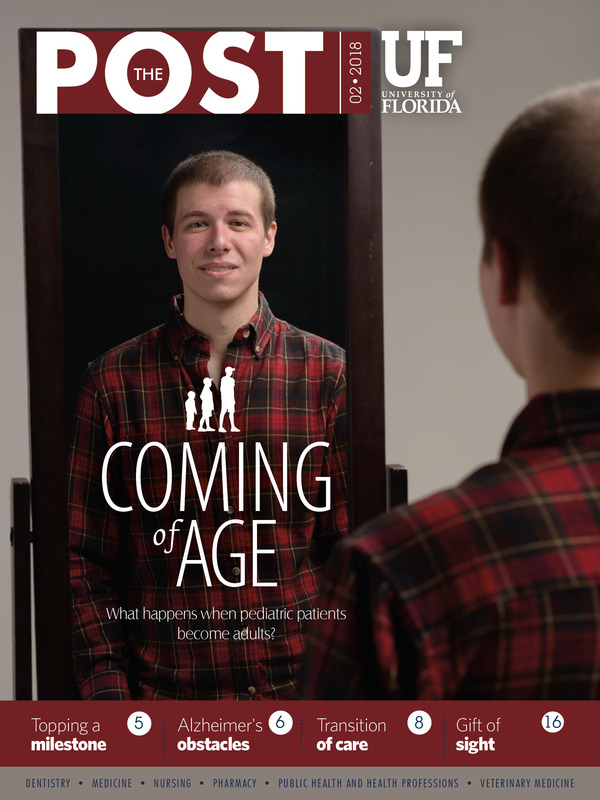 Surgeons typically talk with their patients before and after their procedures, but one UF Health physician recently took this a step further. He had a conversation with his patient throughout her operation, a relatively rare event made possible by unique cooperation between members of the medical team and their willing subject. When Martina Sumner, a chemistry professor at the University of Florida, had surgery under twilight sedation back in the 1990s, it was followed by many days of grogginess and fatigue, causing her to miss a lot of work. Once she learned she needed a hysterectomy, she researched ways to have the procedure without having to go under general anesthesia. “I saw it as an opportunity to try something new,” Sumner said. She reached out to Nash Moawad, M.D., a UF Health minimally invasive gynecologic surgeon, with her request to have the full laparoscopic hysterectomy performed under regional epidural. Moawad, an associate professor in the UF College of Medicine’s department of obstetrics and gynecology, researched the question and thought it over. He then consulted with Kayser Enneking, M.D., a professor of anesthesiology and orthopaedics and rehabilitation in the UF College of Medicine’s department of anesthesiology, and Stephen Vose, M.D., an assistant professor of anesthesiology, also in the UF College of Medicine’s department of anesthesiology. Nationwide, most hysterectomies are performed through an abdominal incision with the patient under general anesthesia. Recovery time for an abdominal hysterectomy requires a two- to three-day hospital stay as well as roughly six weeks of recovery. With advanced training and expertise, Moawad performs all hysterectomies in a minimally invasive fashion, using the laparoscopic or robotic technique. Most of his patients can go home the same day and can resume regular activities within three to four weeks. Moawad and Enneking worked together to create the best plan of care for Sumner, keeping her safety their first priority while figuring out how to avoid general anesthesia or twilight sedation and still ensuring adequate pain control. “We respected Martina’s wishes to not go under general anesthesia and figured out a way to make this happen safely. You don’t find that everywhere,” Moawad said. Enneking’s main concern was the amount of oxygen Sumner would be getting during the surgery. Enneking gave her a continuous positive airway pressure, or CPAP, machine to assist her breathing. “A main part of our success was that we had a good plan in place,” said Enneking, adding that the physicians had a contingency plan in case anything became too uncomfortable for Sumner. Before surgery, Vose gave Sumner two epidural shots in her lower back, one to numb the lower portion of her abdomen and one to numb the upper portion of her abdomen and chest. Sumner stayed in constant communication with the anesthesiologists and surgeon during the entire procedure, letting them know her current state. At one point, she became so comfortable she dozed off on her own. The surgeon removed Sumner’s enlarged uterus, which had fibroid tumors, and treated her endometriosis using tiny incisions with the laparoscope, all while communicating with Sumner to ensure she was comfortable. After surgery, Sumner recovered at UF Health for a few hours and was able to go home that day. Less than one week after surgery, she was ballroom dancing. Two weeks later, she was doing yoga. And by the third week, she went horseback riding. Thanks to the problem-solving care of Moawad and Enneking, Sumner was able to have an innovative surgical experience and recover without the negative effects she dreaded.